Megan Racing Coil-over System for R61 MINI Paceman with adjustable camber plates. Featuring 32 levels of damper force adjustment, separate spring perch height and shock length adjustment allowing you to retain full suspension stroke and to fine tune your suspension characteristics. Compression and rebound settings are easily adjusted through a single damper adjustment knob which is built-in at the top of the damper mount for easy access. Adjustments are simple to tune according to your style of driving and desired comfort level whether you are a professional certified mechanic or an automotive enthusiast with amateur mechanical skills. All of our dampers are capable of handling a +2kg/mm or -2kg/mm change in spring rates to further tune your suspension to your desired handling characteristics. Height adjustments are made with separate CNC-Machined locking spring perches for accuracy and smooth adjustment with separate damper shock length adjustment to retain full-stroke and allows for precision suspension tuning. The wide range of allowable ride-height adjustment allows you to retain the factory ride-height for OEM appearance with performance handling, drop your car all the way down for an aggressive stance, or fine tune your suspension for the race-track to lowering your center of gravity to gain full potential of your vehicle's handling capabilities. On applications utilizing strut-type suspension designs, the Megan Racing Countryman R60 Damper Kits come with fully adjustable Pillow-Ball upper mount camber plates to easily tune and adjust your camber, giving you a huge advantage over other suspension setups. This allows you to tune your car for any ride height and still adjust camber to improve handling, vehicle predictability and tire wear, which is a great benefit both on the race-track and on the street. The quality and durability of the Megan Racing Damper MINI Countryman kits are unmatched. Made of extremely durable Steel and featuring springs that are constructed of SAE-9254 Cold-Wound Steel which are then tested over 500,000 times by compression inspection. With deformation less than 5% and high strength sophisticated surface coating, we stand by our product with our strong warranty. 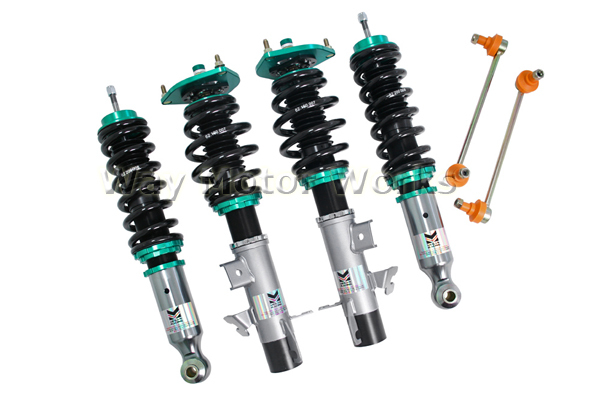 - All coil-over damper kits come with 1-year manufacturer-defect warranty. Sold a a complete set of 4, 2 front and 2 rear with adjustable camber plates.